This reviewer used copies that were sent by the publisher. We all know war is dangerous. Not only for the soldiers doing the fighting, but also for those who go underground to work as spies or resistance fighters to being on the front lines as a reporter. Though I have only seen these two entries in the Women in Action series, I was impressed with how well the books cover the topics in an engaging writing style that immediately draws readers in. 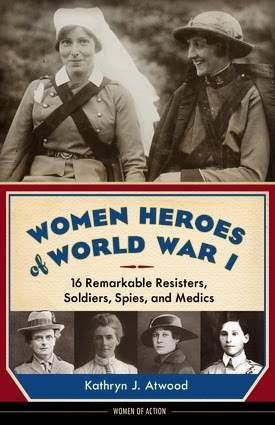 Using dialogue, direct quotes, document and diary experts, Women Heroes of World War I tells the true stories of 16 women from around the world who served their countries during their time of war. The book is divided into four sections: Resisters and Spies, Medical Personnel, Soldiers, and Journalists. At the beginning for each section, Atwood includes historical background information that gives readers a full understanding of what was happening at the time. Though most names will be unfamiliar to many, they were to me -- Edith Cavell, Marthe Cnockaert, Louise de Bettignies, Flora Sandes -- I did recognize American mystery writer Mary Roberts Rinehart. The fast-paced narratives recounts the suspense-filled stories of these exceptional women, many who would be caught and executed, fighting for freedom. 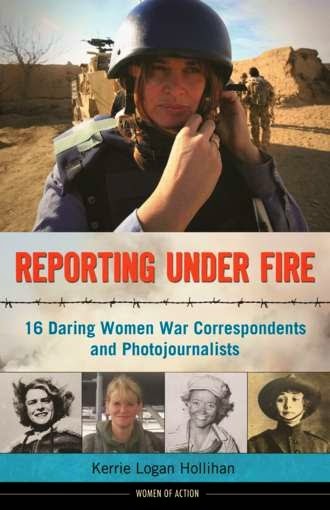 Reporting Under Fire is similar in format as it recounts the remarkable exploits of 16 women who risked their lives to bring back the scoops from the front lines. The book is divided into six sections: World War I, 1914-1918; Between World Wars, 1920-1939; A Second World War, 1939-1945; A Cold War, 1945-1989; Ancient Peoples, Modern Wars, 1955-1985; A Challenge That Never Ends, 1990-Present. Some of the women included are Henrietta Goodnough, aka Peggy Hull, Louise Bryant(her time with husband John Reed is the story of the film, Reds), Dorothy Thompson, Janine di Giovanni, Robin Wright, and Martha Raddatz. Also, Martha Gellhorn, considered one of the greatest war correspondents of the 20th century, and photographer Margaret Bourke-White. Hollihan's narrative is exciting and sheds light on not only the dangers these women faced, but their struggles to be accepted in a field historically dominated by men. Back matter for these books include maps, historical black & white photographs, epilogue, glossary, notes, sidebars, bibliography, and index. Each of the women portrayed in these books were as different as they could be. Some might have been more clever or more gifted in their field, yet their commitment to their ideals is inspiring. Their stories are worth reading, both for they role in our history, and for the opportunities they made possible for the next generation of adventurous young women.